Welcome back, my friends! Thanks once again for sharing a part of your Saturday with me. I always look forward to sharing a bit of your day and I hope you do with me as well. I have some outstanding projects to share with you today, and I hope that you can take time this weekend to create some projects that you have been wanting to do. Today’s projects are sure to bring some inspiration to you so sit back, relax, and enjoy! It is so hard to believe we are in the first week of September. With that said, fall will be rolling in on us soon; so now is the time to start thinking about those beautiful fall colors, pictures, and layouts. Fall is such a wonderful time of the year with all of the beautiful vibrant colors, and I must mention cooler temperatures! 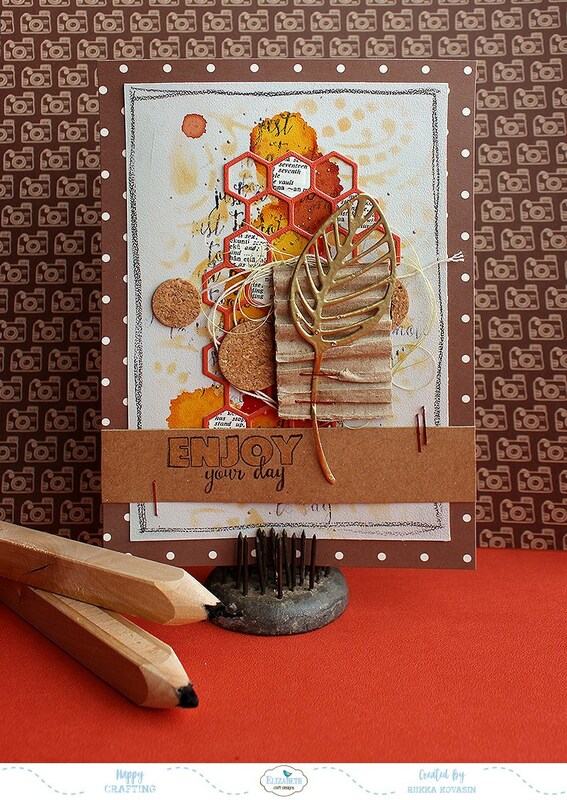 This beautiful layout created by Riikka will really inspire you to celebrate autumn. 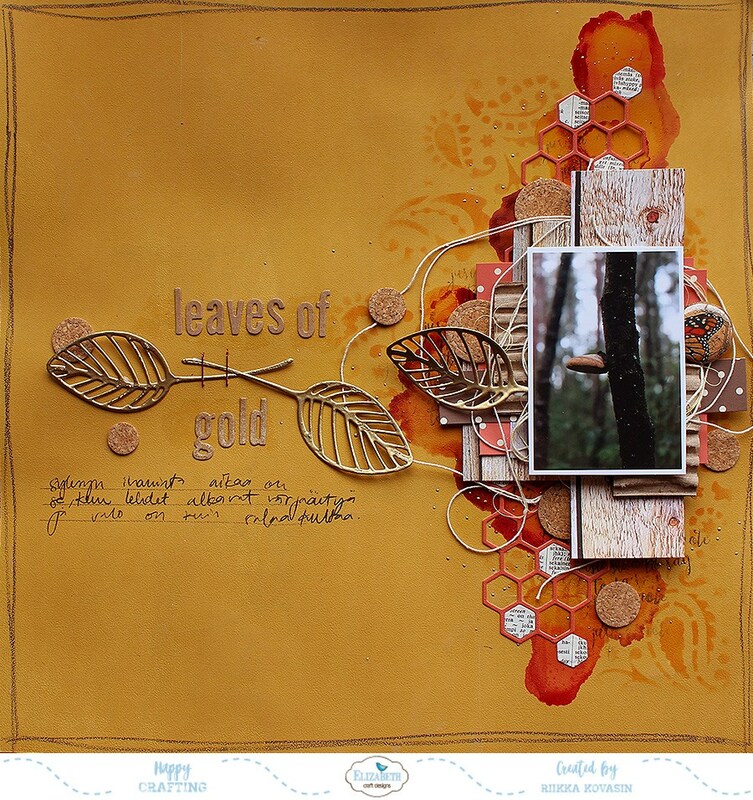 In Riikka’s layout she made her own golden leaves to greet autumn and embellish her layout. Using the same techniques she also created this outstanding card. Tip: When creating a layout take a few moments to use some of the supplies you have out to create a card. You’ll find that you will always have cards on hand, and it is such a great way to use up your scraps! I love the outstanding job that Riikka did on this layout and card. 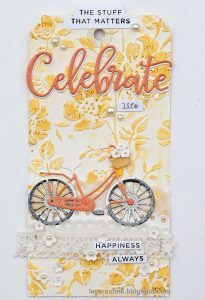 Click here and I will take you over to Elizabeth Crafts and Designs where you will find a full step-by-step tutorial on how Riikka put this beautiful layout together. 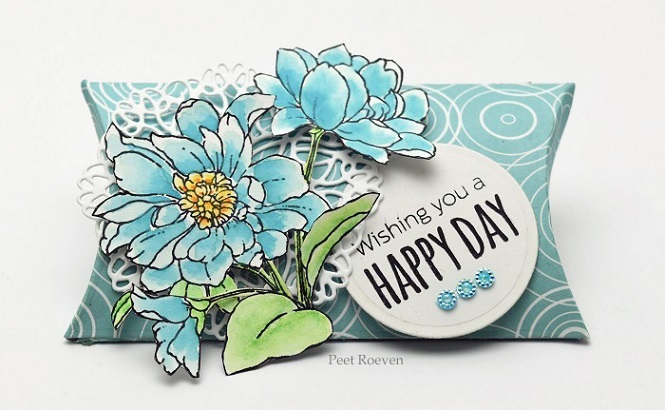 Be sure and check out her blog Paperiliitin where you are sure to be inspired by many more of Riikka’s outstanding projects. Hope this has inspired you as much as it did me. I can hardly wait to jump in and create some autumn layouts! This adorable little pillow box is perfect for a small trinkets like jewelry, candy, or even money. 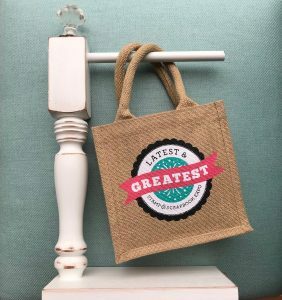 What a great way to present a gift to a special person. Whether you are having a wedding, birthday party, baby shower, or just need a small box for a little gift, this is the ideal box. What a great idea to impress your family and friends. Don’t you just love feminine touch of the fussy-cut flowers layered on top of a small doily? To finish it off, your beautiful coloring will give it the added touch! This die makes the cutest little favor box ever! You will enjoy how easy they are to put together. I love the fun shape and they are such a great size for any number of small treats or gifts. These pillow boxes are so much fun to dress up and easily can match any theme or event. Add a personal sentiment to accent your box. You will put smiles on so many faces! Come with me on over to the Scrapalbum blog where you will find all the supplies you will need to create this adorable pillow box. You will have so much fun you won’t know when to stop! Do you love the look of mixed media? It is so beautiful and so much fun to create. Mixed media is quite the trend right now, and the beauty of working with mixed media means anything goes. Working on canvas is so easy, and if you change your mind it is so easy to take things off and rearrange them. The variety of materials you use will add great detail and makes your canvas a keepsake. 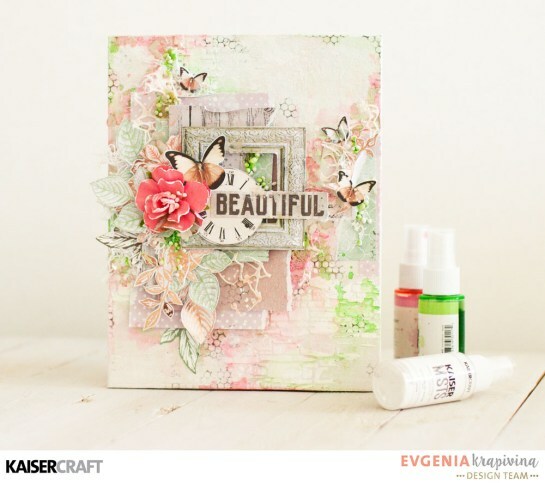 This masterpiece was created by Evgenia Krapivina who is an outstanding design team member for Kaisercraft. This piece of art is all about texture, technique, and a whole lot of imagination. 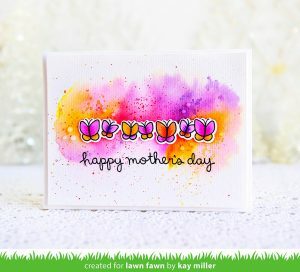 What isn’t there to love when you are using stamps, inks, gesso, embossing, misting, distressing, and so much more? Making mixed media canvas projects can also add beauty to your home. Display projects on your entry or end tables or add it as a decor piece to your wall. It can also be a great conversation piece. I would like to thank Evgenia for sharing her never-ending talent with us. Click here and I will take you over to the janekrapivina blog where you will always leave totally inspired to start your next project. Have fun and let your imagination run free! These scrumptious cookies turn the simplest moments into something memorable. 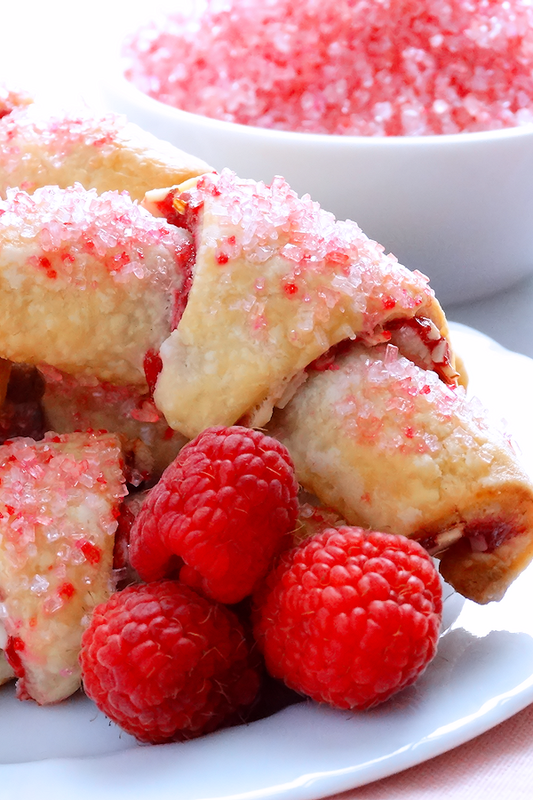 They are the perfect bite-size treat, making a charming crescent shaped cookie roll, and are made with raspberry jam and cream cheese. These are the ideal sweet treat for your holidays but are also wonderful for birthdays and summer entertaining. They are the perfect cookie to serve at bridal and baby showers as well. Party guests will be so impressed that they will be talking about these tasty and pretty cookies for days! Come with me and I will take you over to Wicked Good Kitchen where you will find every step to make these. A big shout out to Stacy Bryce for sharing her wonderful recipe with us. Enjoy! I am really excited to share projects with you every Saturday! Again, I want to say thank you for taking some of your precious time to explore with us here on the Weekly Scrapper blog. I will be in Marlborough September 8th & 9th at Stamp and Scrapbook Expo and I would love the opportunity to see you. I enjoy it so much when you stop by registration and say hi. I look forward to spending some time with you at a Scrapbook Expo near you! Happy crafting, my friends! This entry was posted in At Home, Card Making, Home Decor, Recipes, Saturdays With LeAnn, Scrapbooking, Stamp & Scrapbook Expo, Stamping and tagged Almond, Autumn, coloring, cookies, dessert, Dies, Distressing, Elizabeth Craft Designs, Evgenia Krapivina, Flair Buttons, Fussy Cutting, gesso, gift box, Golden Leaves, Home Decor, inks, KaiserCraft, Mediums, Metallic Rich Gold, misits, Mixed Media, Paperiliitin, Peet Roeven, Penny Black, pillow box, PRIMA, raspberry, Riikka Kovasin, Rugelach, Scrapablum, Shabby Chic, Stacy Bryce, Stamping, Stamps.